Tomb Raider is the new 2018 action-adventure re-boot film directed by Roar Uthaug and written by Geneva Robertson-Dworet and Alastair Siddons, from a story by Evan Daugherty and Robertson-Dworet. It is based on the 2013 video game (beware of films based on video games!!) of the same name, with some elements of its sequel by Crystal Dynamics. There is evidently more plot and story in tho re-boot, making Lara Croft more human than in the previous Angelina Jolie LARA CROFT TOMB RAIDER films. The plot involves Sir Richard Croft (Dominic West) on some silly mission of finding some Queen of Japan’s tomb in some island off Japan. He disappears after giving all his love to his little daughter, Lara. Lara (Alicia Vikander) grows up and searches for him on the island with the help of a Hong Kong boat captain (the delicious looking Hong Kong star Daniel Wu). She encounters the villain (Walter Goggins) and learns that daddy is alive. And the plot thickens right up to a promised sequel. The film contains many loose ends and ridiculous set-ups. For one, why and how the father placed all these clues (example: the first letter in my last destination) while undergoing his tremendous task is questionable. After father and daughter are re-united in a cave, the next scene has Lara Croft armed with a bow and 6 arrows in the quiver attacking the enemy camp single-handedly. Where did she get the weaponry from? After killing 6 or so, there are still 6 arrows in the quiver. Lara Croft is the super heroine that never dies and can solve a dozen puzzles, even if they are never explained satisfactorily to the audience. The trouble with a super heroine is that the audience knows she can never die, and so there is never any real suspense in the action scenes. The action set-ups are all great too look at though, and watching the film in IMAX makes all the action grander but also quite ridiculous. Uthaug and his crew including the actors try too hard to make the film work. The result is a film too serious in intentions such as saving the world at all costs resulting in a plot so convoluted that it turns out confusing and unbelievable. The film also ensures that a sequel is necessary to continue the story. The production budget is $94 million but there are well orchestrated action pieces like the shipwreck segment. 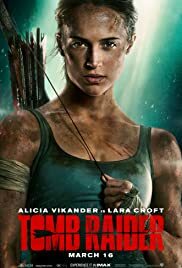 TOMB RAIDER is directed by Norwegian Roar Uthaugh who shot to fame with his Best Foreign Film Oscar Nominee THE WAVE, a Hollywood blockbuster disaster wannabe that I was unimpressed with. TOMB RAIDER gives him the budget and logistics to make his real Hollywood blockbuster. Too bad it turned out a disaster of a movie.